I am 16 hours into longarm quilting this quilt. The pattern says it is 108" square, but it actually measures about 113"x115"! It's amazing how being off on that 1/4" seam allowance can result in a huge amount if the quilt is large! I have the quilt's center within sight, but it is beginning to feel like I will never finish this one. I hit this point with all quilts, but this one is hard because it does have SO many hours left. The client is having it custom quilted. She's a hand quilter, but felt that the size of this quilt was more than she wanted to tackle. 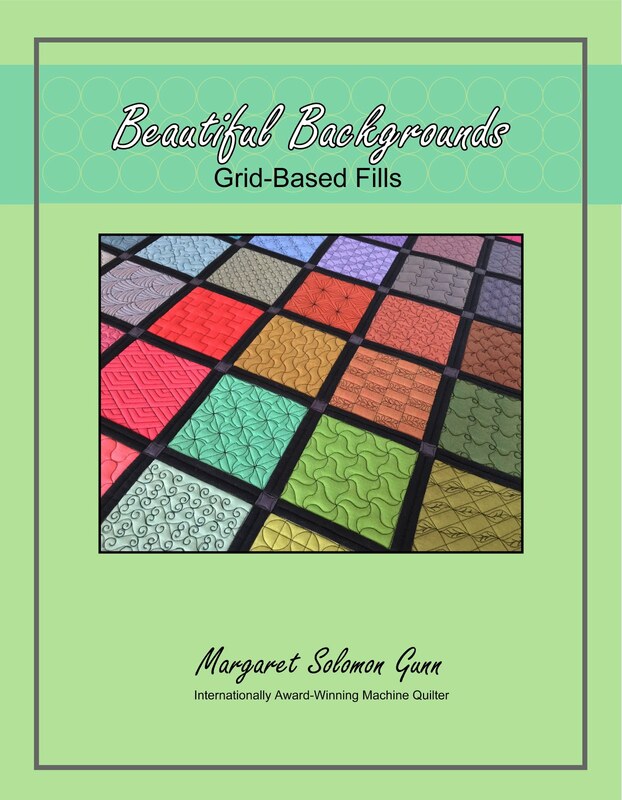 If there is one type of fabric I prefer to avoid as a machine quilter, it is any type of reproduction. They are SO busy. The quilting is hard to see and so is the pattern. I am sure I will feel better when it is off and I can see the patterns, but at this point, I wonder if an all-over of Baptist fans wouldn't have made more sense!! I'll have more to show by the weekend. Kids are now back in school after a most annoying week of not doing much (that is if you don't count them being home this Friday afternoon!). I should run out of my bobbins today, and am not expected to have more before Wednesday afternoon. A 2 day break will be nice. Maybe I will play on a quilt of my own! 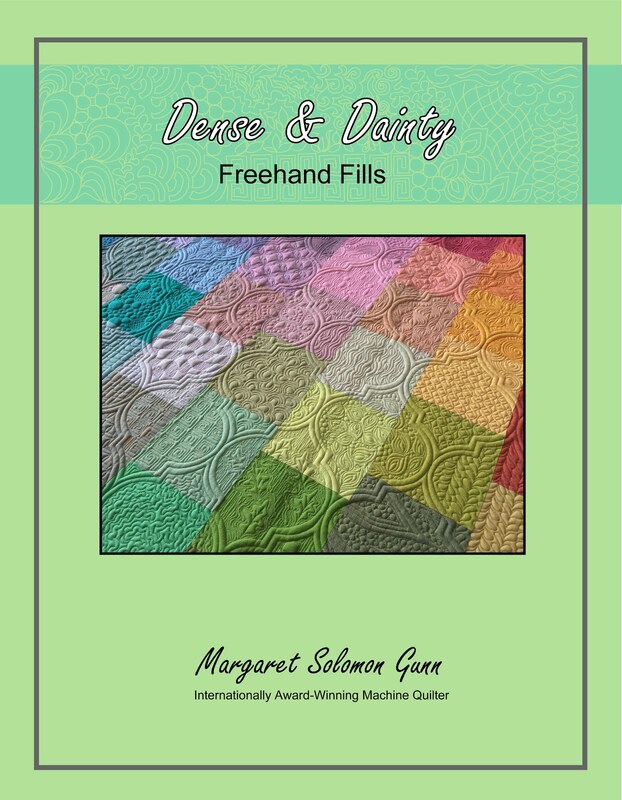 Have you received your Machine Quilting Unlimited?... I got an early edition mailed to me which arrived yesterday. 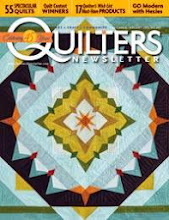 There's a great article, more than 6 pages in fact, on water quilts. My Sea Glass quilt made it into the article! It has a lovely selection of widely diverse quilts for which water of some form has been the inspiration. Sea Glass is one of my more favorite and special quilts made to date. 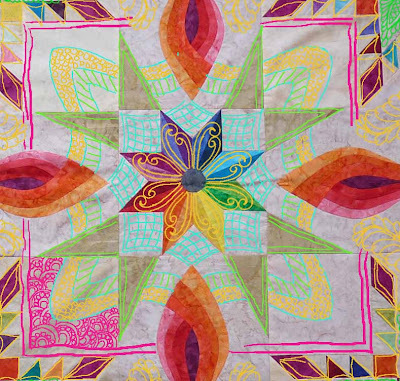 It is painfully simple in design, constructed of just 48 kaleidoscope blocks (albeit with a good bit of applique added). But it's my first quilt of axisymmetric borders, and non-traditional design. My 7 year old middle child, Bryce, loves it. It will forever remind me of his discovery last summer of sea glass. It may have really been a broken beer bottle, but the joy of hunting for it on the beach together made it sea glass. yup, Beatles. Not Beetles, like the bug that would be near flowers. I received what is probably the most unusual quilting request. Initially I really was not sure it could be done cohesively, but give the client what they ask for if you can! She's making a quilt for a friend of her daughter, and she likes botanical things and she loves the Beatles. The quilt is just about 83" square, and has a snuggly flannel backing (which is fantastic for showing off the quilting!). I have a layer of Hobbs 80/20 batting and stitched with one of my favorite threads for E2E jobs, Superior's Omni thread. The quilt is from very lively fabrics. Looks to me to be a pattern made from precuts. It's cool how it creates the white squares on point. I knew that all the detailed requests in the world would never really show up on the heavy prints, so I had to use the ivory fabrics for the things I wanted to show. 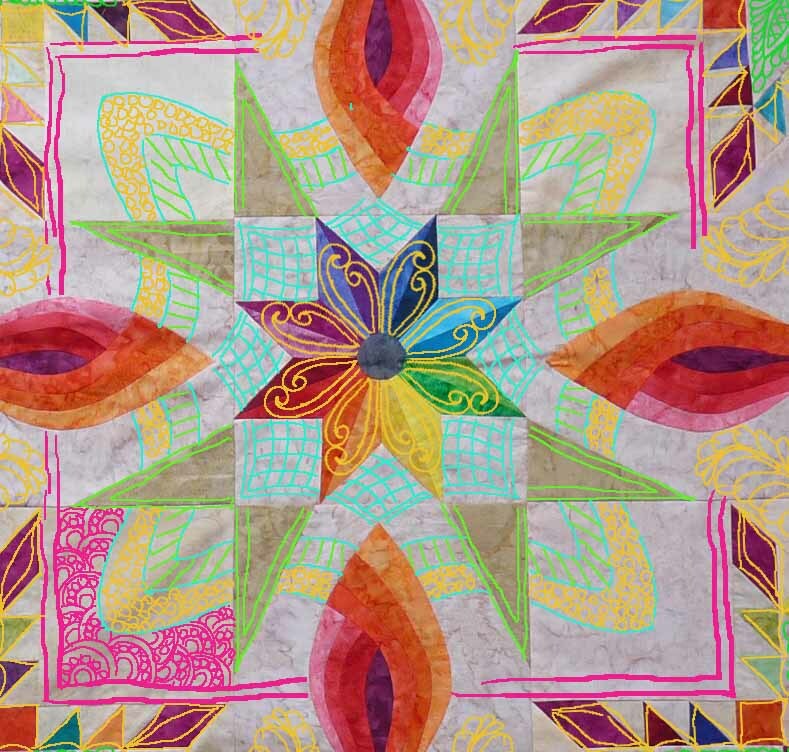 I quilted it with a whimsical freehand that I do often with swirls and echoed feathers. When I reached the white squares, I stitched these leafy/flower shapes. They could be quilted continuously, enabling continuous stitching. This was a fairly time-consuming design to stitch out, but at least the stops and stops were limitted mostly to the edges and when I ran out of bobbin. The ivory border is where it all got a little uncertain. Before I loaded the quilt, I marked out several Beatle's lyrics and song titles along the border with a water soluable pen. I thought I may have to turn the quilt to enable quilting the top, but it turned out I could follow the script upside down and backwards just fine! There are phrases like "All you need is love", "Hey Jude", and "We all live in a yellow submarine", to name a few, all around the border of the quilt. It's personalized to the recipient's taste. The soft green back shows the texture nicely. Swirly, leafy and fun. ...maybe feathers and lines and fillers. So many choices. I don't really like any right now. Disregard my squiggly braid in the dark gray. It is freehanded, and looks horrible. I have a stencil should I go this route. With one large-ish quilt on the frame right now, I am gearing up for the 2 very large customs coming up next. I think I will get one loaded next week while all the crazies are home on school vacation, but most of the week will be devoted to allowing my left wrist to heal before I embark on an excess of rulerwork. I got a couple finishes this week - enough to satisfactorily prove that my machine is functioning just pefectly. 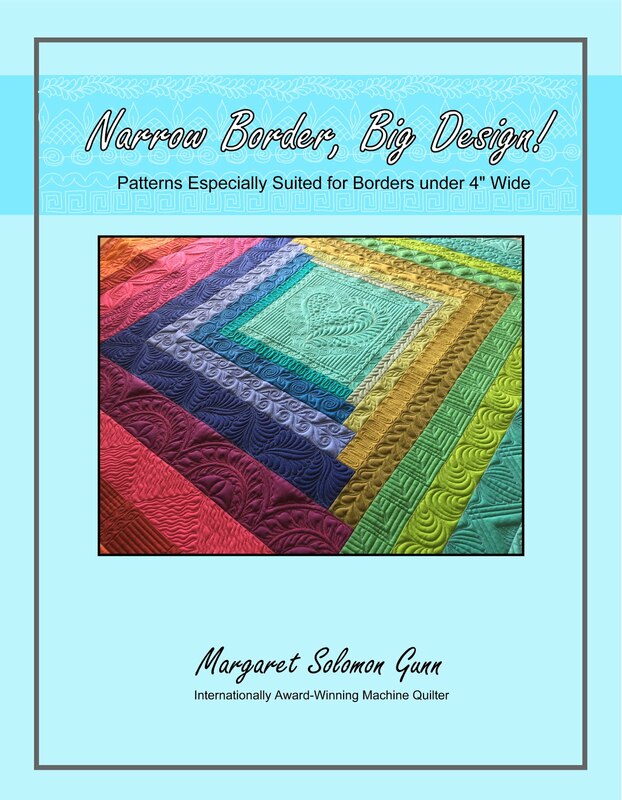 I wondered after having many issues on the thicker miniature quilt. I am overjoyed not to have an equipment problem. Learnings are tucked into my hat for another day. This is a small wall-hanging that the owner only wanted an edge-to-edge on. It is stitched with a plum Glide thread. The colors are perfect for me, and the ombre fabric is very interesting. It's another gorgeously warm day in the not-so-frigid northeast today. Who'd have thought that the average February temperture would hover near 30F! It is usual to have a week of sub-zero, but not this year. I think we have had under 24" of total snowfall, all winter. My hyacinths are already poking through!! It is no secret that I do a lot of hand applique. You have seen some of the quilts I have appliqued over the recent years. (or you can look here, here and here). It started as I needed something to do while my students were taking exams. And then I got so I liked doing it in the evenings because I don't want to leave my husband on the couch alone and go to the basement to sew (where all my machines are set up). Without something to sew on at night after the kids are in bed, I will just fall asleep in my chair. And that is pittiful. This is my latest and probably wildest creation. I have had these boldly colored hand-dyes for a couple years. My husband bought me a stack of 24 FQ for my birthday a few bdays back. I used all the purple and aqua ones on one of the quilts shows in the above links, and needed to find something for the red, yellow and orange ones. As you can see, I have used a good bit of purple as well. I guess it is just in my blood. All of the tans are really scrappy (as in there are 5 or 6 different shades actually used)...they were left over from my Sea Glass quilt. I have finished stitching the border "ribbons" and am now making all the necessary adjustments to them as I miter all the corners and attach the border triangles to the body of the quilt. I have a number of tiny circles to still add after that is done. My hope is to get this done and into the quilting queue so it can be finished by the mid-Summer, but I'm not sure that's in the cards. Quilting at Casa Quilts of Love is fairly busy right now, and this is a large quilt not to be rushed. In the couple days of downtime lately, I started another broken star, this time out of batiks. I really love the way the first one I did came out, and thought it was perfectly suited for a watery look. The setting squares are paper pieced, which you should know by now I loathe paper piecing. It's a pain, and is slow, and oh, so messy. But, nevertheless, this is how these "reed"like blocks are done. Two down, another 6 needing the 3 parts assembled. You should know to expect from me that there will be hand applique on these squares...something to jazz these up a bit, and give this smewhat traditional type star a personal and unique twist. As one that does a considerable amount of applique, I must make sure you are aware of a wonderful pair of scissors. These are serrated-edge scissors, that were developed by Karen Kay Buckley. I learned of these 18 months ago when I tookher hand-applique class, but being cheap, I didn't buy them then. I actually go them for Christmas from my mom this year. I have the larger size, and they are a perfect size for hand cutting fabrics. They grip the fabric and give you a perfect cut. Trust me, these are a great thing to have if you applique. Not sure how I made it without them this long. Please, Oh please...send me some easier quilts! My back aches. My left hand is throbbing from the excess of ruler work. My neck needs a brace (and about 18 uninterrupted hours in bed-ha!). You get the picture. I am 14 hours into the 2nd Stars for a New Day miniature in 2 weeks. The end is joyfully in sight, which is good. The deadline for entering this into MQX is looming at 5 days away, and the client really wants/needs to have it done. Her's just happened to be the 2nd one I quilted by the random nature of it being on the bottom on the hanger. I don't want her to miss her MQX experience and debut because I was having technical glitches. By technical, I mean for some reason, this is the quilt that just about would not allow me to quilt it. I did the 1st of these rather seam-heavy, double-batted quilts without so much as a broken thread. It was completely smooth sailing. Then, between the two mini-monsters, I stitched a lap quilt (albeit a pantograph), and had no issues with th stitching. It looks great. Then as soon as I started this quilt, it was as though the voodoo curse of the quilt was in place. The thread broke about 15 times in my first hour of stitching. This is immensely annoying to have to pick out the stitches in order to knot and burry every break! I got to practice all kinds of vulgarities and obscenities though while the kids were at school. Fun being able to vent one's frustration without having to softly mutter nice things in a growly voice. I asked plenty of great quilters for advice on this problem, but all indicators were that it had come out of timing. I couldn't sew right to left OR bottom to top, whatsoever. Freaky. But, off on another quilt sandwich, it sewed like a dream in any direction. More Freaky. 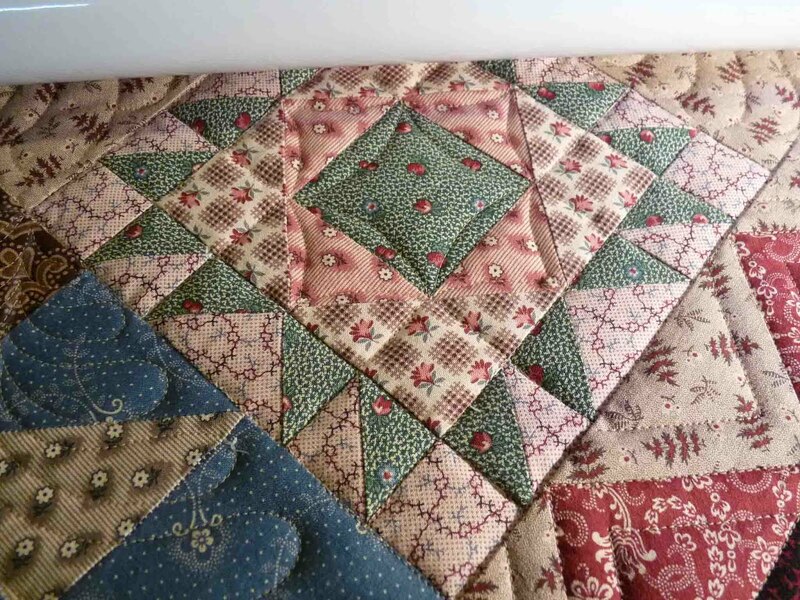 OK, so it is something about this particular quilt that is causing the problems. Maybe the thickness is slightly different/more than the 1st quilt. Or maybe the white-on-white fabric is part of it (more problems on this). Either way, I have to do customs, and I have 2 king sized ones next in line. My guess is it is a combination of thickness and thickness. 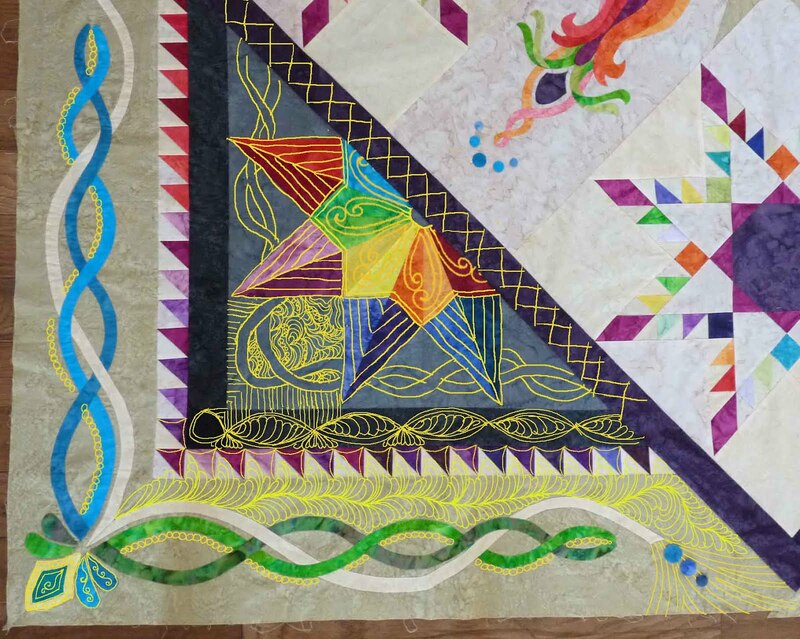 The quilting on the center of the feathered star broke 4 times. There is a LOT of bulk here. You can see from the pictures that I am getting it quited. I have slowed my stitching down to a practical crawl speed to avoid the breaks. It's annoying...there are times on straight sections that you just want to zoom. I have not done those 3-hour stars (between the feathers),and I am really dreading them. I must formulate a good plan for how to do them without to much screaming. You may also notice that I have stitched the sections of this quilt differently than the first quilt. It's not been easy, because I like certain motifs. I have not been able to do the cross-hatching whatsoever on this quilt, which frustrates me. It is so lovely and versatile. Hopefully it will be equally as impressive as the other quilt. Nobody wants to think that they got the less desireable quilt. And hopefully I meet the Tuesday deadline! Oh gosh golly... I just spoke with the owner of the quilt. She's so sweet to call, but she was concerned that the quilt is getting my body & may sanity. I feel bad...The quilt is coming along lovely, rest assured. And I will make it through the process fine as well. I'd rather have a challenging day quilting a custom any day of the week than be stuck with only an endless pile of pantographs! I just don't want to do another miniature for a while :-) I love your quilt; your technique is amazing. Thanks for bringing the quilt, and thanks for caring. This is page 1 of the April 2012 American Patchwork & Quilting. One of my most fabulous clients allerted me to this article over the weekend. This article is about her daughter, also a client of mine, and the 13 quilts she made in the 18 months leading up to her wedding. The quilts were part of her modern-day dowry, and they were beautifully displayed at her wedding reception. Maybe some of you caught this story as it unfolded several months ago. It is posted here. So upon hearing of her story going in a magazine, I went right out on Satuday and found the magazine. The photos they showed are lovely. In fact, I quilted each of these shown in the magazine, and another seven of the thirteen. Want to see?...Ok, maybe not, but they are here anyways, and here, and here, and here, and here and here, and here, and here, and let's not forget the show quilt that earned a 3rd place. There are a few that obviously never made it into blog posts, but I have pictures of them on my computer. Just humor me, I need a little vent. It has always been my understanding that journalists should be held to the utmost in standards. They shouln't be allowed to report half the story, because the readers might actually believe only the half they are saying. This lovely article makes absolutely NO mention to the person that actually made these lovely tops into quilts. Imagine my anger and horror. I am a professional that relies on referral of clients by what is published, or shown at quilt shows, or word of mouth. 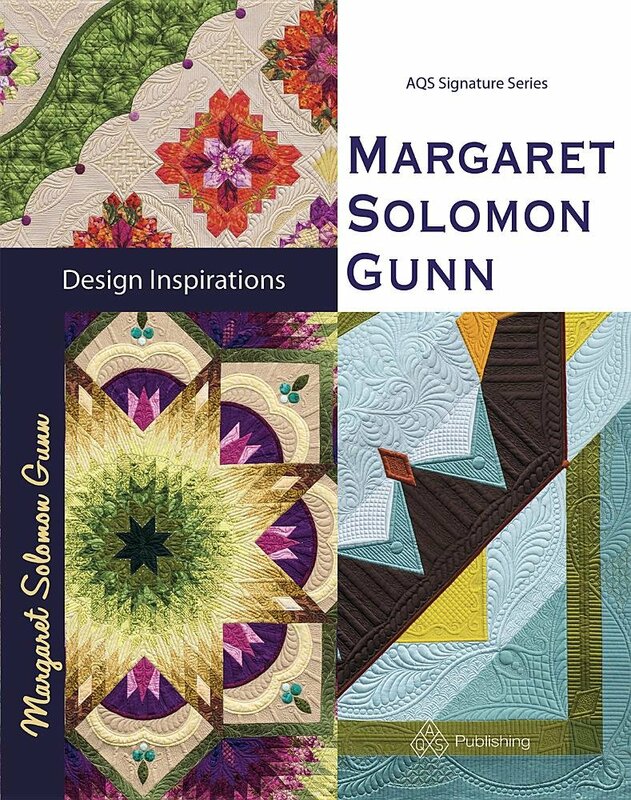 Quilt shows are not allowed to not make mention of the quilter. Otherwise they may as well be called Flimsy shows. I doubt that would catch on. I hate stirring up hornet nests, but I just had to send a message to the editor this morning. 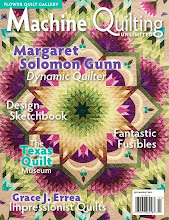 They manage to publish the quilter's name with every quilt pattern & photo that they include in their magazines. So why not here? If there was not a dedicated quilter behind the scenes, it may well have only been 12 quilts. One of these was quilted a week before the wedding, just hours before I left on vacation. I could have very easily said no, but I happily did not. So, fellow quilters out there, let's unite. Tell the publications that this crap is unacceptable. I'm not looking for my 12 seconds in the limelight, just the appropriate credit for what has been done. The story is all her's. I just want small text beside the photo indicating that I quilted them. Simple. I spent 17 hours quilting this mini-beast, after one of the borders was removed and flipped on account of it being accidentally inverted. Not bad on my 15 hour estimate I'd say, considering this is my first miniature. I love how it turned out. The texture is just delicious. It has a QD wool batt over Hobbs 80/20. As an aside, I dislike the QD wool as compared to the Hobbs Tuscany. It seems tougher, rougher. In the end, I'm not sure the difference is discernable though. Top threads are all coordinating Superior So Fine, with Bottomline bobbins. I'm not really sure if these are actually CW repros or not, but the fabrics just did not scream out for bolder colors or shiny threads. JMHO there. The outer border is a departure for me. It's almost got an Aztek feel, but these axisymmetrical stars stumped my sense of design. I didn't want to just micro stipple around them. This next picture is about my favorite. 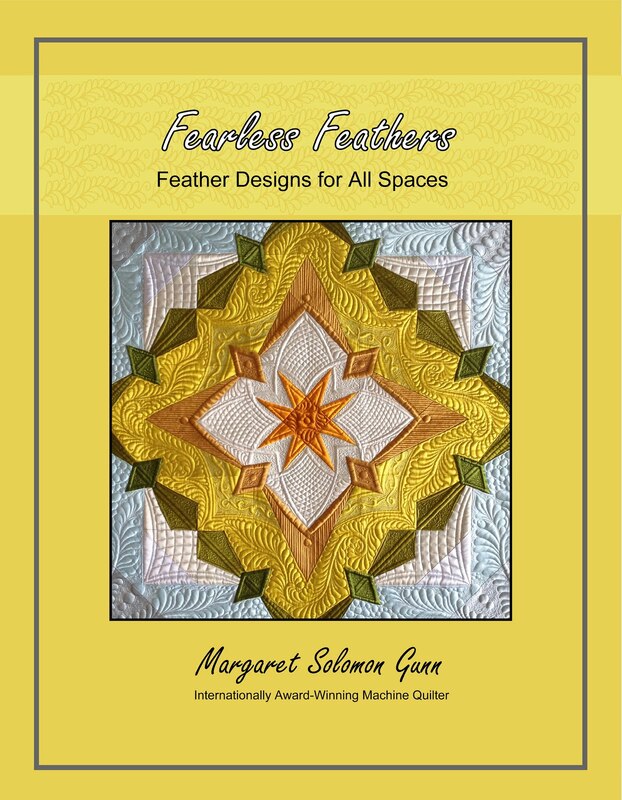 The long sweeping feathers flank the more simply quilted 3-hour stars. Thise are about the best back-tracking feathers I think I have sewn. It's just a nice juxtaposition of simple straight cross-hatching with the graceful curves of the feathers. That is what quilt design is all about. Variety, simplicity, repetition. Move the eyes constantly, but allow them to settle for a second or two, here and there. I still cannot believe that this feathered star is only 7" square. And it is totally outline stitched. Those little triangles are tinier than my fingernails. I actually had to rip out one corner of the curved cross-hatching because it had the wrong number of curves. Kinda maddening. Here, it is all about the stitching designs. And it is fun. It moves, and is playful. It's all I hoped it would be. Let's hope that number 2 goes faster, and with as few issues as this one had. I plan to use some different motifs so that these 2 friends have similar yet not identical miniature quilts. Now, off to think about a couple simpler quilts before I dive into this insanity for 5 days.